John Paul Pet is a line of top-quality pet grooming products from John Paul DeJoria, co-founder of Paul Mitchell Systems for hair salons. I was familiar with Paul Mitchell products before, but what I didn't know is that they revolutionized the salon industry by banning animal testing on their line of haircare products. This eventually led to the creation of John Paul Pet shampoos, conditioners, sprays and pet wipes. These products contain an optimum pH balance for pets, and the entire line is “tested on humans first” to ensure effectiveness and safety for all pets. The company also supports several programs benefiting animals, which I think is really wonderful! 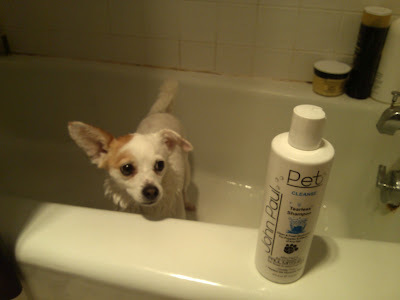 I was given the opportunity to review one of the Grooming System Packs - the Puppy Care Pack - with my dog, Dotty. She isn't really a puppy anymore (although she looks and acts like one!) but she doesn't like baths so this pack is perfect for her. It includes Tearless Shampoo, Waterless Foam Shampoo, and Full Body & Paw Wipes. During our vacation up north to the cabin, the waterless foam shampoo and full body wipes came in very handy. Not only did they save me from having to give Dotty a bath in filtered lake water, but it also meant I could bathe her as often as necessary without taking much time or effort. And believe me - she definitely needed several baths that week! The waterless foam was easy to rub into her coat and then brush out, leaving her soft and shiny. She seemed to actually enjoy the process...I bet she didn't even know she was getting bathed! The full body & paw wipes were especially helpful after Dotty got muddy in the rain. 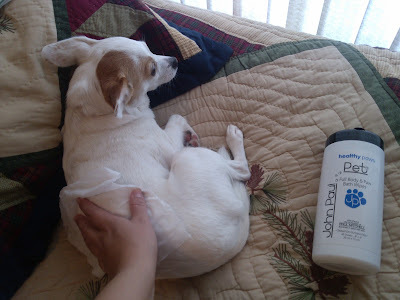 The moisturizing formula helped soften her dry and cracked paw pads, and it was super easy to clean her up with the wipes. These are great for on-the-go or for muddy spring days, or just for a quick coat refresher. Once we got home from vacation, I gave Dotty a full bath with the tearless shampoo, which seemed to really help condition her coat and left her smelling great. It has a nice, soft scent reminiscent of baby powder. And best of all - it was gentle and non-irritating. Dotty really likes this line of products and would recommend John Paul Pet to any cat or dog owners. I would love to try the Ear & Eye Wipes on her next since she gets so much buildup around her eyes. I also plan to try the Waterless Foaming Shampoo on my water-hating cat as well, since it is formulated for both dogs and cats. Want to try these products on your own pets? 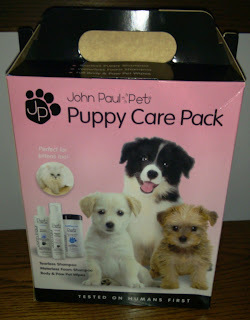 Enter below to WIN a John Paul Pet grooming pack! The ear wipes -- ear mites are always such a problem! I went to a Paul Mitchell School and thought I'd gone to HEAVEN when they released more products! I love all of them but we use the tearless shampoo, tea tree shampoo, bath wipes, and the new awapoochi rinse! <3 JPPET!!! Ultra Bright sounds just perfect for our dog, Dot. She's a Brittany and mainly white, and ALWAYS getting dingy! I would choose the grooming pack.